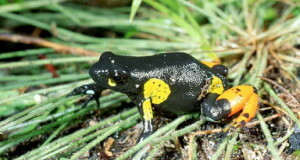 The success that hobbyists have had in establishing breeding populations of so many species of poison frogs is truly astonishing, and has served a greater purpose in removing the financial incentive to collect them from the wild. Unfortunately, the extraordinary parental care supplied by many poison frogs is difficult to observe in captivity, and the most effective way of rearing the tadpoles is to remove them from their parents’ terrarium. I was most fortunate to have had the opportunity to observe the breeding behavior of wild strawberry poison frogs in Tortuguero, Costa Rica, and in a large zoo exhibit. Strawberry poison frog tadpoles, which are moved by the female frog to individual water-filled bromeliad stems, exhibit what has been termed “begging behavior” when their mother visits their pools. When the female lowers her vent into the water, the tadpole moves against her, stiffens, and vibrates. This stimulates the female to release 1-5 unfertilized eggs, which comprise the tadpole’s sole diet. She visits and feeds each of her offspring, every other day or so, for the 43-52 days that they remain in the tadpole stage…no wonder these tiny moms eat so much! When one considers the complexity of the frog’s rainforest environment, especially as compared to the size of the frog, the female’s ability to locate each tadpole borders on the unbelievable. Outstanding herpetologist Elke Zimmermann (in “Breeding Terrarium Animals, 1986. TFH: Neptune City, NJ) has even observed females to dip their heads into bromeliad pools before laying, and notes that disturbances from other than the mother frog sends the tadpole into retreat. 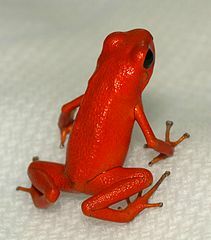 Field research in Panama indicates that female strawberry poison frogs consistently avoid feeding other than their own progeny. I was able to observe parental care only in huge exhibits and the wild, but please write in if you would like to try at home…it’s well worth the effort.